Known as the home of singing and dancing, the land of fruits, and the place of gold and jade stones, Xinjiang Uyghur Autonomous Region of China boasts for its vast expanse, beautiful landscape and unique folk customs. There are in total over 1,100 registered scenic areas in Xinjiang, ranking first in the country. In a selection of the best scenic areas in Xinjiang by Tourism Bureau of Xinjiang Uygur Autonomous Region, the follow 10 won the highest scores in public appraisal and professional evaluation. 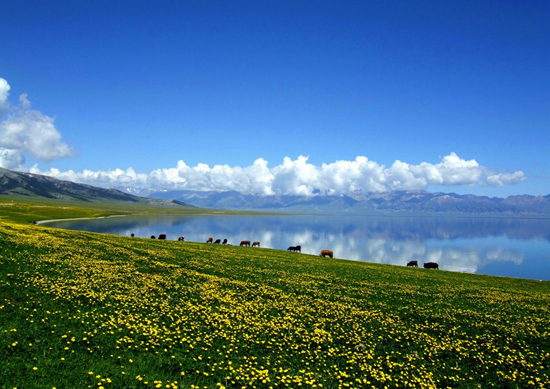 Sayram Lake, renowned as a pearl on the Silk Road, is the largest and highest alpine lake in Xinjiang. With an altitude of 2,073 meters, it is located about 90 kilometers southwest of Botala Prefecture, Urumqi. The lake has quite a few nicknames. In ancient China, it was called the "clean sea." In Mongolian language, Sayram means 'a lake on the ridge'. In Kazakh language, it means 'blessing'. Because it is the last place that the warm and humid air current of the Atlantic Ocean reaches, it is also known as the "Atlantic Ocean's last teardrop." The oval-shaped lake is about 30 kilometers long and, 25 kilometers, covering an area of 455 to 460 square kilometers. The deepest point of the lake measures 92 meters. The main source of the lake is rainwater and ground water, in addition to some water flows from a few small rivers. The water in the lake is pure, clear and peaceful, attracting flocks of ducks and swans. Flourishing cypress and cedar trees cover the whole mountain range. Herds of horses and sheep graze on the pastures. The best seasons to visit Sayram Lake are summer and autumn. Known as the home of singing and dancing, the land of fruits, and the place of gold and jade stones, China's Xinjiang boasts for its vast expanse, beautiful landscape and unique folk customs.